Indyeah, you gave me my very first blog award -- thank you so much! :) You inspired this award-giving bonanza of mine. Indyeah is someone I met only recently, but not a day passes that I do not visit her blog, CONSIDER IT CRASHED. Her topics range from the beauty of her homeland, India, to events occurring halfway around the world. Regardless of her theme, each of her posts are an inspiration. A true must-read. 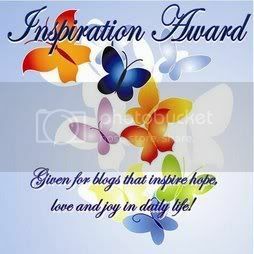 You get the "Inspiration Award" from me. I like to think of Marc's blog, Daily Writing Practice, as my very own personal writing boot camp. Every day he presents a new writing exercise, with prompts as varied and various as dead batteries, clocks, and strange noises. I credit him for helping me get my Muse back in shape. Thanks, Marc! 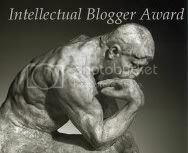 You get the "Intellectual Blogger Award" from me. April has probably the best blog title I've ever seen, Mistress of Well-Intentioned Indecision. Her blog is witty, insightful, and she's a formidable writer to boot, having written a novel this past November for NaNoWriMo. (I just know I butchered that acronym. Oh well.) My hat's off to you, April, for being one of the most creative bloggers I know. 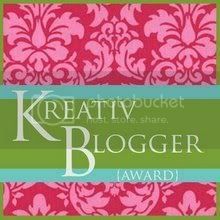 You get the "Kreativ Blogger Award" from me. ALRO is yet another blogger who wrote a novel this past November. Way to go ALRO! His blog, ALRO's Mayhem, is part fictional experimentation, part music/gaming discussion, and 100% excellent. You rock, ALRO! :) You get the "Excellent Award" from me. 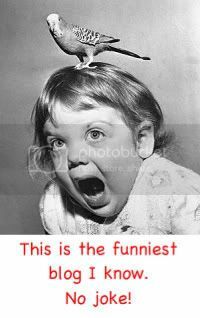 This blog, Nancy's Nonsense of Nothingness, is one that is sure to keep you in stitches. You are one funny woman, Nancy Face! Let me know when you decide to tour as a stand-up comedienne, because I'll be sitting front row. You get the "Funniest Blog Award" from me. Lauren is a webmistress extraordinaire, owning not one but two (at last count) blogs. But I must give her credit for her main blog, Busy Bee Lauren. There is no topic under the sun she will not cover, nothing she is too embarrassed to discuss. The best part? Every post is utterly fascinating. I suspect she could write about static cling and still be interesting. Her blog is the awesomeness. You get the "Bees Knees Award" from me. Hannah is one of my very favorite bloggy friends. She always leaves the sweetest comments, and her blog, Pink Chucks, is pretty sweet, too! You get the "Cat's Meow Award" from me. I love Stacey's blog, Stace's Place, because you get the impression that the persona she puts forth in her blog is the real, genuine Stacey. She does it all -- run a full household, raise four adorable kids, plus keep up-to-date with the Twilight world. Stacey's a true renaissance woman. You get the "Fabulous Blog Award" from me. Ann Marie's blog, An Old Fashioned Girl, caters to my love of all things crafty and girly-girl. True to her blog's name, Ann Marie really is an old fashioned girl. She's got a heart of gold and a warmhearted personality that comes across in both her blog posts and her comments on other blogs. Definitely the nicest blogger I know! :) You get the "Nice Matters Award" from me. Lala, you get this award because I think your blog, My castle in Spain, is one of the best around, if not the best. It's got gorgeous pictures, gorgeous writing, pretty much everything you could ask for in a blog. I'm so happy I decided to click on it when it was featured as a Blog of Note, and I can see why you were chosen by Blogger. You get my "Best Blog Award!" thanks dearie! I feel loved :) just so you know, if I was giving blog awards I would totally give yours one. even if I don't have time to check all the new blog posts, your is one of the first I check. :0 Thank you for the honourable mention :DD! It's very much appreciated! Btw, what do you mean how to post links to your blog posts; do you mean how to post them elsewhere on the Internet? @ Abel, I mean that your blog post had links at the end of it and I wanted to know how to include links like that within my posts. oh la la...as we say in French, this is too much ! As in you wish to link to the tags from within your post? After you tag several posts with the same tag, you can copy the link off of the link that shows under your post and use that within the entry. If I'm being too vague or still not understanding, feel free to ask me to explain further xD I'm not so good at explaining things. Wow! Let me say, I have been really inspired by your blog lately, as it has been enviably noticed by so many! I really want to spiff up mine a bit.. Thanks so much for the kind words! 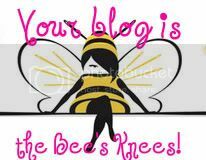 And I will check out some of these blogs you love so much and maybe I will love them too. 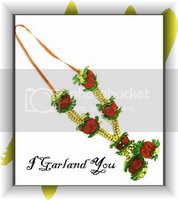 I will wear my garland with pride - and even share it with my wife. Thank you! THANK YOU!!! You MADE my night! I have to admit, I am somewhat embarrassed to have you read my blog because you are a teacher, and an incredible writer, and lets just say... I am not. You are one cool chickee, and I love your writing, all your comments and twilight love..
Also have to share.. You are my girl with Music! I am so exited to see The Smiths, The Cure and Depeche Mode on your playlist! Ok.. Last time.. I swear! I forgot to say HAPPY 300th POST! Hope there is MANY more to come! I promise.. I'm done.. Bye. Thanks very much Ana - and just to show how undeserving I am, when reading your post to my girlfriend it took me three tries to pronounce 'intellectual' correctly. LOL @ Marc - your comment made me laugh so hard my side hurts. Hope you're happy. Oh Ana!What a beautiful ceremony!And an even more beautiful award! :)I absolutely LOVE mine! It has butterflies ! !MY favourite.. Thank you SO much for these words!Thank you. :)Cant tell you how much! And such a giving heart you have!Such a! And such beautiful awards!All of them!Will be visiting everyone!Lala I already know. Ana! you ROCK! 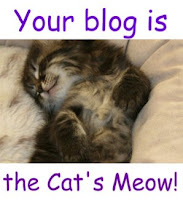 :) i'm so happy that my blog is the cat's meow - it's SO adorable!! wowzer ;) thanks so much!! i love reading your blog and having you read mine. and just so you know, i can't stop smiling! LOL that my mom commented as me. I was all, "WTF?...I don't remember seeing this post!" hahah! Anyway, OH MY GOODNESS! I loooooove that award! it is super cute! YOU are the awesomeness! 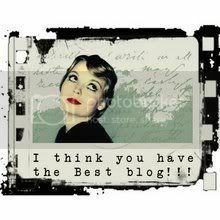 HEY.. thank you very much for taking the time to write about my blog ... you are AWESOME!!! Ana I adore you, thank you sweetie. I am honored that I was even considered! That made my day! You are awesome! 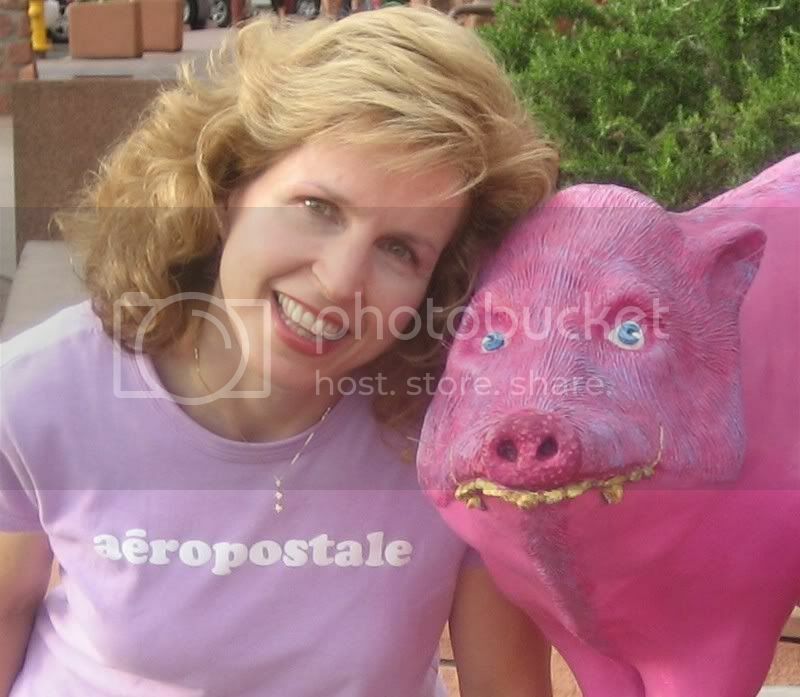 Nice pic too of you and your boyfriend! Take care and thank you again! I feel special! Congrats to everyone else too!